Nuts and Bolts: Custom Card Requests: Tips to Seal the Deal. Wishing a Happy June to all of the fabulous GCU artists out there in greeting card land. We are always surprised and always enjoy receiving custom requests and look forward to customizing cards for our customers’ specific needs. Your customer has taken the time to find your card, select it, and contact you for customization. Feel proud of that fact! We wanted to share some tips and tricks, which have helped us seal the deal and increase sales. After you have received a custom request email from GCU, try to respond to your custom requestor as quickly as possible. Communication needs to occur within the Custom Card Requests section on GCU. Also make sure to check the Custom Card Request section when you are signed into your account every so often. To find it sign in to your account, click on Manage Store > Images & Cards > Manage Custom Requests. On occasion some artists have experienced a delay or non-delivery of a Custom Request email, but in our experience this has not occurred. Keep copies of original files with layers so you can customize your cards easily. Don’t forget you can also download images of your cards from GCU. Helpful if you need to just change the color of something or add an element requested by the shopper. Perhaps if you have a blank card with that image on GCU you can download and add text or elements requested by the shopper. Also, check and make sure you don’t already have the card requested in your line. This has happened to us a couple of times so we just sent the customer the link to the card, which was already in our gallery. Creating variations for a custom request card has also been beneficial to our sales and customer support. We received a Custom Request email from GCU from a customer who stated she wanted to purchase 20 copies of a custom created Thank You in Japanese card. Here is an example the Thank You greeting card written in Japanese the customer wished to change. The customer requested the text to be in Japanese and vertical on the card. We created two variations of the card. The original image was vertical but the customer ended up purchasing the horizontal version we had created. We thought the customer might like it and it was a simple fix. We contacted the customer and sent links to both of the cards (which we placed in our Private Gallery for quick access) to the customer. Note from GCU: for customer requested cards you can submit via FastTrack, Private or Private-Waive Review. For FastTrack and Private be sure to add a Note to Reviewer about why you need an expedient review (customer request) and if the design is based on a previously approved card list that card’s pid#. If you choose Private-Waive Review, be sure to double check your work as you will be responsible for returned cards due to artist error. Within your Manage Custom Card Requests section on GCU send a link to the card by copying the text link after selecting the Sell this Card $ icon. This can be found under the card you have created for your shopper in your Private Gallery or when it’s live in the GCU marketplace. 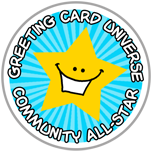 If your custom request shopper is a new customer to GCU, you can earn an extra $.50 for each card sold through this link, which also includes any other cards the new customer might purchase along with the custom requested card you have designed. Another hint is to also mention to your custom requestor any GCU sales or promotions currently taking place. This has often yielded quicker and more sales for us. Seal the deal! Don’t worry if your custom request card is not purchased right away. We have had many instances where the card was not purchased immediately and sometimes not until a couple of weeks later. Wait a couple of days and if you haven’t seen any card clicks/activity on the custom card, then send a reminder email. Here are a couple of links to previous posts about Custom Card Requests. Check out this original post by Corrie on handling customer requests. Excellent advice! Thank you for sharing, Jay and Susan! Great article and tips, Jay and Susan!